First Line: I like the police force. Things are going rather well for Detective Constable Fiona Griffiths of the Cardiff, Wales, police force. For once she feels as though she may have a shot at living on planet Normal. Until the box she ticked on a form stating she was interested in undercover work comes back to haunt her. Working undercover as a payroll clerk and an office cleaner, Fiona Griffiths is now Fiona Grey. She's had to give up her old life entirely in order to infiltrate a criminal gang, and when she's finally accepted as one of them, she's totally alone and vulnerable. And the most unpredictable person you'll ever run across. Quite simply put, I love this series. Three books featuring Fiona Griffiths have been published so far. I've read all three, and I've given all three the highest rating possible. I've never done that before, and it will probably be a long time before I do it again. My passion for this series has everything to do with the marvelous character Harry Bingham has created. Fiona Griffiths has Cotard's syndrome, a rare mental illness in which the afflicted person is deluded into thinking that they are dead, either figuratively or literally. This affects everything about her. Her behavior. What she eats. If she eats. The way she views the world. What she thinks of other people. Everything. What Fiona wants most in the world is to be a citizen of the planet Normal, and she has to work hard at it. She has to remember to say the things that her boyfriend expects to hear, for instance. She's a by-the-book supervisor's nightmare. On the Cardiff police force, she's usually given work that's performed alone because she works best that way-- even if she has grown tired of it. If you begin reading the series from the beginning (Talking to the Dead)-- which I recommend you do-- Fiona's going to seem downright weird. But there's something appealing about her. Perhaps it's because she tries so hard to be normal. Before you know it, you realize that Fiona's stopped being weird; you've actually grown to care about her and to want her to succeed. 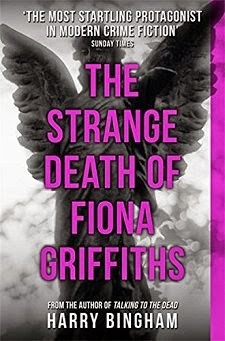 The plot of The Strange Death of Fiona Griffiths is guaranteed to tie you into knots. The absolute worst thing a person with Cotard's syndrome can do is to work undercover, but that's exactly what Fiona does-- for months at a time. As I watched her begin to melt into her undercover persona, I actually became worried. This book-- and the entire series-- is something that you can easily lose yourself inside, just like Fiona Griffiths is losing herself in Fiona Grey. The gang she finds herself working for puts her through incredible security measures, and her isolation grows steadily since the only person she has any real contact with is Vic, the extremely violent security specialist for the villains. Fiona's own unpredictability adds to the suspense and to a very real feeling of danger. You never know what she's going to do. Has she just done something incredibly stupid that's ultimately going to get her killed? Or has she just done something brilliant that will convince the bad guys that she's completely under their thumb? Yes... you can read this book as a standalone if you must, but I don't recommend it. If you're looking for an excellent characterization and tightly woven, exciting plots, you deserve to read every single Fiona Griffith book. Fiona deserves it, too. She's brilliant. Not a cookie cutter in sight with this series! Oh, yes. Soon. Soon. Definitely on my list. And I've never heard of Cotard's syndrome. So very odd. So glad to see the third book is out. Definitely not a formulaic series at all, very inventive. I enjoyed the first book in the series and am looking for the second. Is your review of the second book posted? Also, I hope the Fiona finds out about her past in one of the books and finds out why she has Cotard's Syndrome.